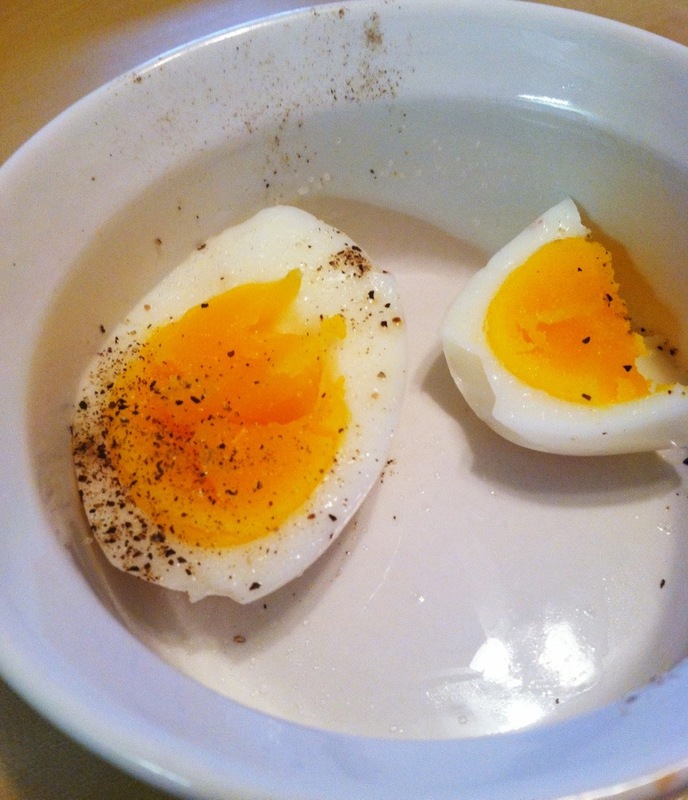 Hard boiled eggs are my favorite high-protein snack. I recently learned that steaming farm fresh eggs for 17 minutes is actually a better way to prepare them. Fresh eggs are hard to peel once they’ve been boiled. Hard boiled (or steamed) eggs can be kept, in their shell, in the fridge, for up to a week. So make a dozen at the beginning of the week for protein rich, ready to eat snacks. Go to localharvest.org to find local eggs near you. Your tiny 8 year old heart was about to explode with joy. Well, maybe the rest of you have grown up a little more than me, but as far as I’m concerned, anytime I see pizza I still feel like eating it while laying on my stomach on the floor and watching a crummy edited VHS version of The Indian in the Cupboard. (true story). Nowadays, the pizza is the only thing that’s grown up. And the movies. Sometimes. 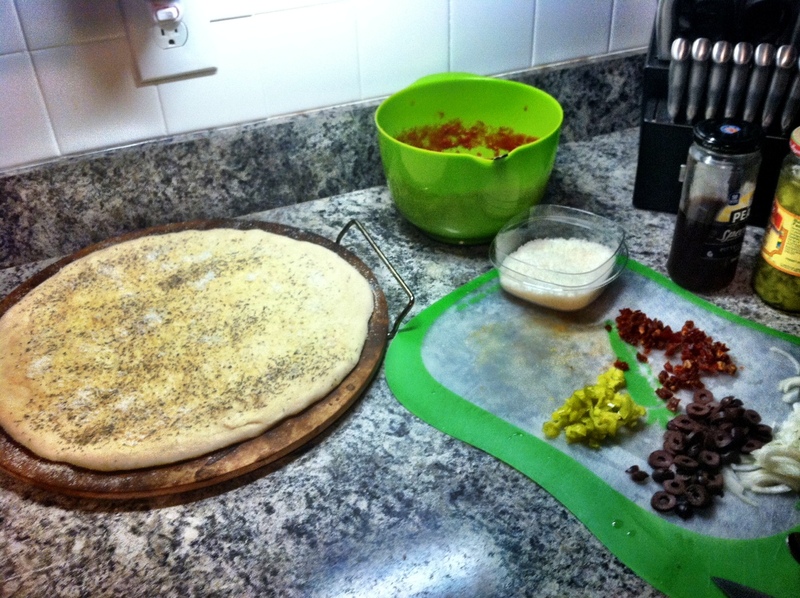 Making your own pizza at home is super easy, super cheap and super fast. 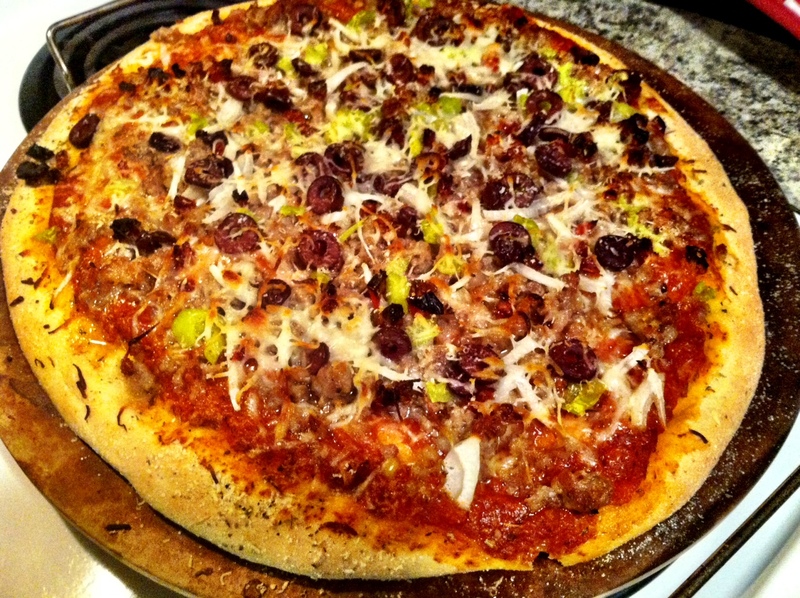 You can seriously make a pizza at home, from scratch, in less time than it would take you to order a pizza and have it delivered by a high school kid who has hit every bump on the way to your house, causing the majority of your pizza toppings to remain firmly attached to the roof of the pizza box. I started making this pizza crust years ago, and it’s so easy it’s absurd. Like, it’s actually insane to me that everyone doesn’t do this and that people still buy pre-made pizza crust. First, there are only FIVE ingredients (besides water), most of which you probably already have in your cabinets. Second, the crust is this delicious, chewy, wonderful thing when you’re done. Not too thick, not too thin. If you’re one of those people who likes pizza that is essentially a heavily topped cracker, this is not for you. And for those of you who like pizza that was baked in a cake pan and you have to eat with a fork, it’s so thick, this is not for you. 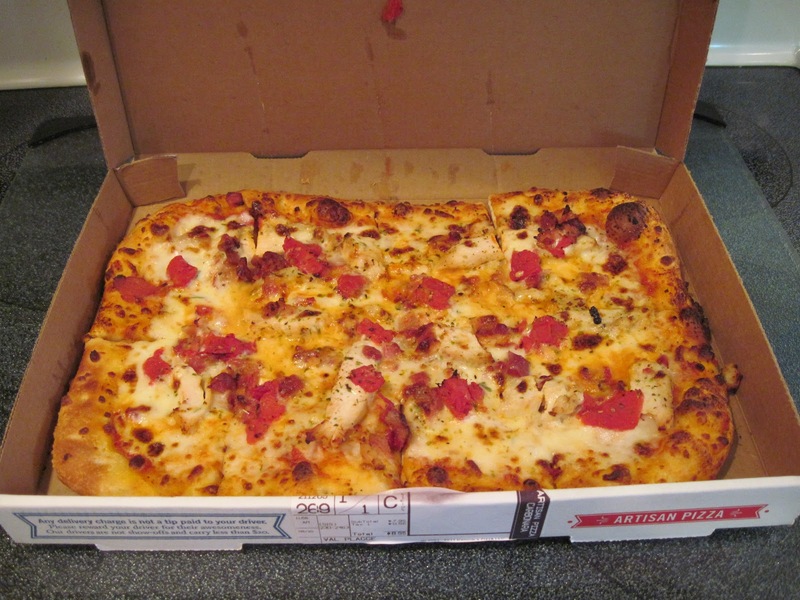 But for everyone else – this is our pizza crust. Knead the dough very lightly just until a ball of dough forms. Let dough rest in the bowl for 10 minutes. 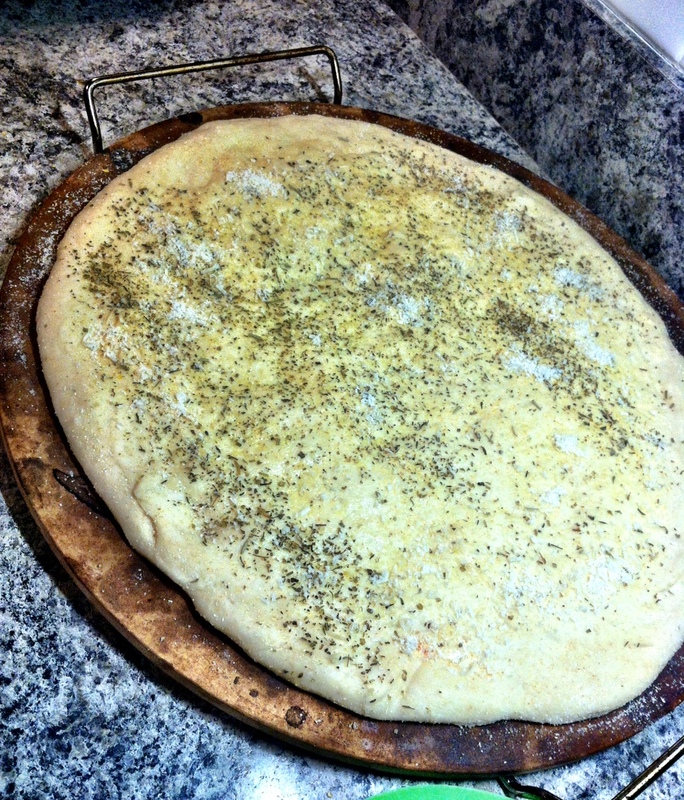 Pat dough out onto pizza stone or pan into desired shape, 1/4” thick. Top with olive oil, garlic powder and herbs, if desired before topping with ingredients. Bake at 425 for 15-20 minutes or until done. Let rest five minutes before cutting and serving. 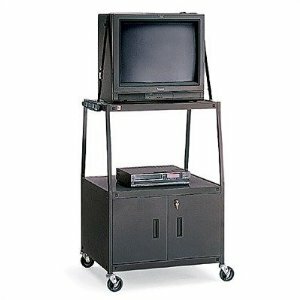 And your 8 year old self is going to just want to grab it and stuff it in your face before that greedy kid with the runny nose touches it. I hated Ramen growing up. My sister used to eat top ramen what seemed like every day and then one day my dad told me the noodles were worms and that was IT for about 10 years. Then…I went to college. And I became a vegetarian. And a broke college student. Enter: my wormy Ramen nemesis. It doesn’t matter how much you detest something…if it’s .15 cents a package, it’s hard to deny. So I started experimenting with it and seeing if I could make it taste like something besides just noodles and it worked. I discovered all kinds of combinations that included adding frozen peas, shrimp (I ate seafood), tofu, onions, spices, sauces, and so on. And Ramen became a thing I could eat again without gagging a little bit. However, I will only eat the “Oriental” flavored ramen, I still think the others are pretty gross. Lately, I’ve just wanted soup. Just brothy, simple, hot hot hot soup. So I pulled an old college grocery store trip, got four packs of Ramen for $1 (you used to be able to get at least 5 for $1- sheesh, this inflation is out of control! ), a pack of extra-firm tofu and a bundle of green onions. I brought it home, cooked the soup according to the directions, adding a quarter of the block of tofu, diced into small cubes, in at the end with the flavor packet. Then I added a healthy splash of Sriracha sauce (I like my soup spicy! ), and a little hoisin sauce. Then I topped the bowl with two green onions, snipped up with a pair of kitchen shears. I realize this is no great culinary genius, but man was it exactly what I wanted. I’m definitely glad I don’t have to eat this several times a week anymore, but it’s still pretty yummy. And filling! Also, for the ramen lover in your life, this spork is obviously necessary. Too bad my sister didn’t have that back in 1992…. A midnight snack for maniacs. I literally went to the store at 11:45 for this stuff and was eating it during the last 30 minutes of Saturday Night Live. 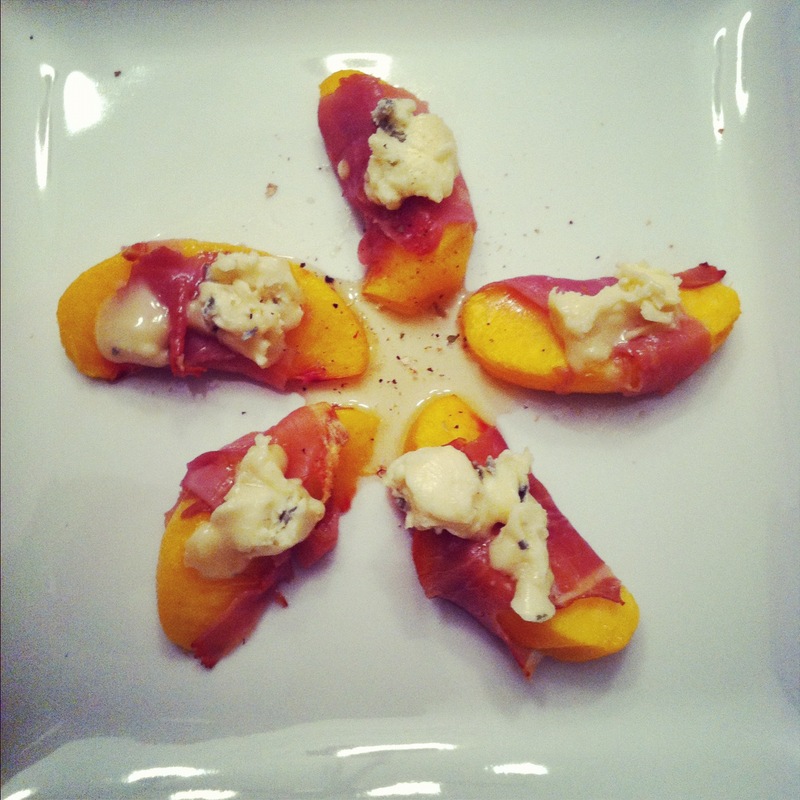 Let’s break it down: fresh, local Knotts Island peaches, wrapped in prosciutto and broiled for about 4 minutes, then topped with Blue d’Auvergne and drizzled with local honey and fresh cracked red and black peppercorns. I don’t really have to get into details about how good this was, I don’t think. You get the picture. What is your favorite midnight snack? 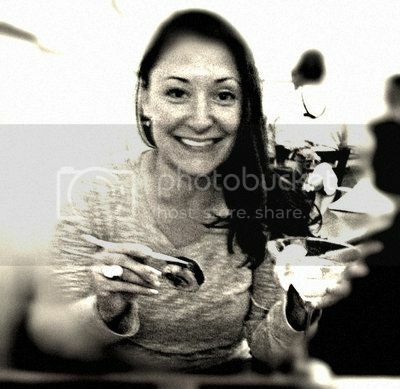 What’s the craziest thing you ever went out at midnight to eat?